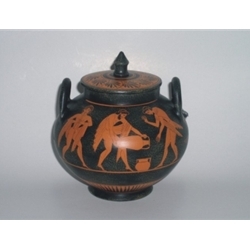 We have the largest selection of Greek vases. or choose a vase from any museum you might have visited. We have an exclusive relationship with a master potter and artist painter in Athens Greece. They will custom make any vase in any size for you. As much as possible, these artists use the same tools, materials and methods used by the original artists. See our artists at work. Or call us at 866-472-4090 or 517-347-7983 for a free estimate.